Break’s over, back to snowing! The wait is over, another storm is here! I know, it’s been all of 18 hours since the last one, but sometimes mother nature has it set on rapid fire. Snowbasin was the big winner from yesterday’s storm with 9″. It’s a small number by Utah standards, but combined with the rest of the storms this week it’ll add up. This next storm promises to be even better. Tonight’s storm is coming in stages. The first is passing right now. This wave is being forced by warm air moving in aloft. Mount Baldy has increased in temperature from 13°F to 19°F since this morning while being socked in the entire day. A loop of this wave of snowfall is attached below, and you can see how the precipitation is moving from south to north. Also notice how the Cottonwoods are still getting snow even though it’s cleared out to their west. Alta had already reported 6″ by 2 PM, and this is just additional love. That’s how you get those big numbers! 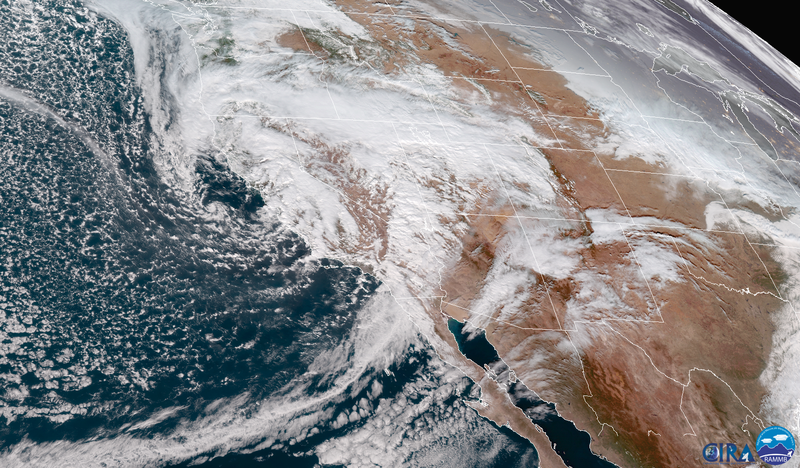 Check out this absolutely stunning image from NOAA’s new GOES-17 satellite (still in testing, not operational). You can see the first wave from the radar loop to our north, and then you can see the long, comma-shaped area of clouds going way down south across Las Vegas and San Diego. That is the cold front associated with this storm, and it has pulled quite a bit of moisture in from the tropics. There’s still a question of where the snow will fall heaviest tonight, but someone is going to win big when that front hits the mountains. After tonight’s storm, we’ll enjoy a period of wet, unstable flow. It’ll be cloudy with some scattered showers in the mountains. Right now it’s looking like there will be a wave first thing Friday morning and another later in the day. Saturday looks like the perfect day to go out and enjoy this bounty. It’ll be partly cloudy and maybe a bit breezy. I’m forecasting 20″ for most mountain locations between this morning and Saturday. We’re watching another storm for Saturday night into Sunday, so stay tuned!